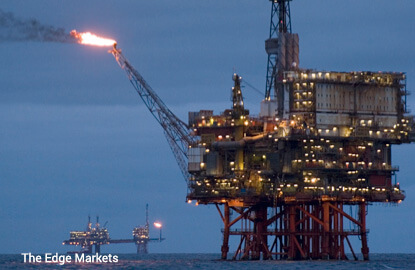 SINGAPORE (Feb 1): Oil dipped on Wednesday, weighed by ongoing high supplies despite an OPEC-led production cut, but prices remained within a narrow range that has bound the market since late January. Brent crude futures, the international benchmark for oil prices, were trading at $55.48 per barrel at 0140 GMT, down 10 cents from their last close. U.S. West Texas Intermediate (WTI) crude futures were at $52.73 a barrel, down 8 cents. The Organization of the Petroleum Exporting Countries (OPEC) has said it will cut production by around 1.2 million barrels per day (bpd) in the first half of 2017 in an effort to end global over-production that has dogged markets for over two years. A Reuters survey published late on Tuesday showed that OPEC's output fell by over 1 million bpd in January to 32.27 million bpd between December and January. "That's a good start...to cut production to bring the market back toward balance," said Greg McKenna, chief market strategist at futures brokerage AxiTrader. But McKenna added that there were still "some questions about whether or not OPEC will achieve its goals" to cut even deeper and for the full period of the first half of 2017. With uncertainty over the final outcome of OPEC's cuts and also little known so far regarding Russia's commitments to its supply reductions, crude futures have been range-bound, trading within a $2 per barrel range over the past week, and within $1.25 a barrel since Monday.